The last day of the Second Annual CYFI Regional Meeting for Europe and Central Asia truly went in the sign of celebration and was closed with great excitement, as European Central Bank President Mr. Mario Draghi gave a closing speech about the importance of financial inclusion and education for the health of the society and the region and got awarded by the youth of the region as the ‘Financial Inclusion Champion’ in Europe and Central Asia. The speech by Mr. Draghi followed the presentation by the youth representatives with proposals on how they think the ECB can help in fostering financial education and inclusion for children and youth. The youth also invited Mr. Draghi to take part of the celebrations of Global Money Week 2014. A smiling Mr. Draghi thanked the youth for the extent of invitation and said that he would be glad to try to join the celebrations. Introduce tax reduction for young entrepreneurs and entrepreneurship in the school curriculum. Every child graduating from primary-school should have the right to have a bank account. All school curriculum should include Economic Citizenship Education. In response to these calls for action Mr. Draghi stated that youth are calling for action on the same points that Europe is calling for: transparency and access to financial services and bank accounts. He further stated his support of the issues that the youth addressed, and that he goal of the ECB; a truly European banking sector with a European banking union, could be a platform to implement youth financial inclusion. We sincerely thank Mr. Draghi for his support and congratulate him on being awarded by the youth as ‘Financial Inclusion Champion’ in Europe and Central Asia. Earlier on Tuesday European and Central Asian leaders cold also engage with the youth on their ideas for their future as financially included, educated and entrepreneurial citizens of their countries. The discussions on three core matters: financial inclusion, financial education and youth entrepreneurship. They youth on the stage representing the young people of their countries told the audience that many of their peers still do not know that the subject of financial education exists, and that we need to change this. They also addressed that many children and youth have a lack of self-confidence and independent thinking, and that we need to empower them and build their confidence to make sure that they will believe in themselves and in their own decisions. One representative stated: “School have been made easy to go through without learning about real life skills”. This was a point that they wanted to change. One suggestion to do this was to introduce internship to the school curriculum to make sure that the young people build their confidence and get to experience real life situations. Another point that was made during the sessions was the fact that current financial education is focusing too much on macroeconomics, but is missing the private financial issues. An issue that was raised is that there is currently little access to information about entrepreneurship and how to become an entrepreneur. There is also insufficient access to start up funds. One possible solution for this that was suggested by the youngsters was to engage more crowd funding to raise funds for young entrepreneurs and their endeavors. Another call for action form the youth was that the subject of entrepreneurship needs to be introduced to the school curriculum. This subject should focus on developing entrepreneurial skills and connect traditional subjects like math to an entrepreneurship setting. The third topic of financial inclusion, that the youth had named ‘Re-shaping for inclusion’ focused on how to make youth more financially included and what they found necessary in order to make this happen. They stated that increasing financial inclusion for children is essential for them to be empowered. A point that was made by the youth presenting was that if they are able to spend at a certain age – why not be able to save at the same age? Mr. Panagiotis Strouzas, Head of the Financial Services Policy Division at the Directorate General Financial Stability of the ECB chaired this session, which brought together several themes and discussions from the past two days, including key themes during the Youth/policy-maker dialogue during the morning. Mr. Stouzas started by emphasizing the seminal role of financial literacy and inclusion for children and youth towards financial stability. Mr. Bram Stoffele, Partnership and Certification Manager at CYFI, and youth representatives Mr. Kirill Akhmetov and Mr. Bogdan Baciu reflected on the state of child and youth financial inclusion in Europe and Central Asia. 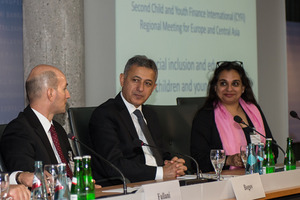 Observing that financial access levels differ greatly throughout the region and statistics for child and youth access are scarcely available, they argued that financial access needs to be complemented by independent financial capability training and quality standards for child and youth friendly banking products to ensure real financial inclusion. They finished by presenting preliminary results of a CYFI survey of banking products and educational programs for children and youth which seems to corroborate the view that most child and youth banking accounts currently don’t fulfill these requirements, and financial education programs offered currently by financial institutions often lack a holistic perspective or sufficient safeguards for independence. Ms. Tracey Bleakley, CEO of Pfeg (UK), shared the success story of child and youth financial education in the UK. Through the concerted efforts of the Personal Finance Education Group (Pfeg), schools and children, government, and the financial sector, financial education is now top on the political agenda. In February 2013 the government took the decision to integrate financial education in England’s national secondary education curriculum. Reflecting on next steps, Ms. Bleakley commented that ‘maybe we should get over ourselves’ and accept that children and youth already engage with the financial system in many ways (e.g. through prepaid mobile phones and internet transactions), and that their safe financial inclusion would be a logical step, provided parents can decide when their children can be given greater financial autonomy. Mr. Hidde van der Veer, Aflatoun, concluded the session, emphasizing the importance of providing children and youth with a more holistic concept of economic citizenship education, moving beyond financial education only, including life skills and livelihoods education. Luís Vas, Head of Financial Literacy Unit at the Bank of Portugal presented on the rationale for promoting both financial education and inclusion, and the importance of events such as Global Money Week in order to do this. He pointed out that Global Money Week and similar events is key for Bank of Portugal to help promote the importance of financial education and inclusion. Mr. Vas also shared what the Bank of Portugal had learned from arranging Global Money Week and similar events. Philippe Racine, Founder and CSO, Ekomini Inc., was the second panelist to present, and addressed how technology can be used to engage children and youth to learn about money matters. The Republic of Macedonia was the winner of the Global Money Week award for Europe and Central Asia of 2013. Ms. Kristina Nikolovska, Assistant to the Governor of the National Bank of the Republic of Macedonia, shared the story of how they celebrated Global Money Week, which went under the slogan “Learning By Playing”. She expressed why it is important for countries to engage in Global Money Week by pointing out that it is a way to rise the level of financial literacy among youth, while at the same time rise awareness of the importance of being financially literate and included. 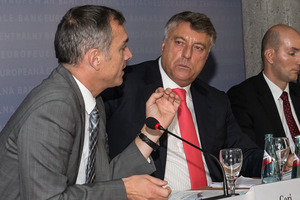 She further stated that Macedonia are committed to take part of Global Money Week 2014 and make it even bigger than 2013. During the last part of the session three youth representatives presented the ideas that they had come up with together with the other youth at the meeting for how they wanted to celebrate Global Money Week 2014. The ideas presented included involving universities all over the world in TEDx Talks, involve social media channels, having a school week dedicated all the subject to finance and money matters, entrepreneurial contests and challenges as well as a Global Money Week song and having children teach their parents about financial inclusion and education. The first day of the Second CYFI Annual Regional Meeting for Europe & Central Asia started off with a bang on Monday morning! We are very excited to share the day with you! With this Daily Digest of the meeting we would like to share the day in short with the rest of the Movement. Follow the Meeting on Social Media! The designated hashtag for the event is #CYFIEurope. Mr. Constâncio emphasized the long-term benefits for both youth and their communities to understand financial literacy & inclusion, as he argued that it will not only affect the lives of youth themselves, but also the financial stability and economic growth. At the same time he also addressed the challenges that are still to be overcome for youth financial inclusion. He also pointed out the opportunity to listen to the opinions of the 25 youth participants on the meeting. “It is rare for us to hear the opinion of youth, and I think we should listen carefully”. He continued saying: “Our children have enormous potential, we need to help them fulfill it”. At the Inaugural Session the governor from the National Bank of the Republic of Macedonia, Dimitar Bogov and the governor of Bank of Albania, Ardian Fullani, as well as UNICEF Director for Europe and Central Asia, Philippe Cori and the chairman of the Capital Markets Board of Turkey, Mr. Vahdettin Ertaş, took the stage together with CYFI founder and managing director Jeroo Billimoria. One of the great surprises of the morning was the announcement that the Republic of Macedonia will be hosting the next CYFI Regional Meeting for Europe and Central Asia in 2014. The session also focused on sharing all the great commitments and initiatives that have been made by Albania, the Republic of Macedonia and Turkey. Mr. Ertaş, further stressed the importance of financial inclusion for Turkey, as well as four Europe and Central Asia as a region. 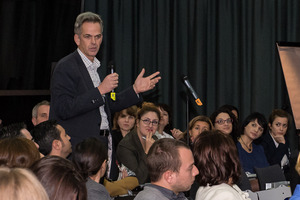 In addition to explaining the commitment to financial literacy and inclusion by the Bank of Albania, Mr. Fullani, shared his personal experiences with children and youth in Albania and how they have inspired the continuous engagement for such initiatives. He pointed out that we need to start considering youth stakeholders of our society. He also stated that children are drivers of change of our society, and the inclusion and empowerment of youth is, and will continue to be, a key priority of UNICEF and the UN. The second session, ‘Celebrating the Movement’, was moderated by Mr. Koen Vermeltfoort, Partner at McKinsey & Company. During the session another great announcement was made. Mr. Joseph Falzon, Dean of the Faculty of Economics, Management and Accountancy who was representing the Ministry of Education from Malta, proclaimed the commitment of the Ministry of Education of Malta to fully support and collaborate with CYFI with promoting and implementing financial education. During the session Mr. Marin Molosag, First Deputy Governor, National Bank of Moldova stated his support of the Movement and of its goals. He ellaborated, stating that financial literacy is a form of wider self interest, promoting financial literacy is a public good. The third session of the day was on how to create an integrated approach for youth economic citizenship. Moderated by Chris Sier, Director at Financial Services Knowledge Transfer Network, the session became a dynamic and interactive part of the morning where many of the delegates gave their views on financial education, inclusion and the complexity of integrating initiatives to policy. 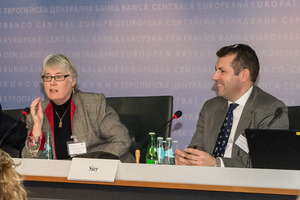 Panelists were Ms. Catherine Fagan, Chair of the International Association for Citizenship, Social and Economics Education at the University of Glasgow and Mr. Anatoly G. Gavrilenko, Chairman of Expert Group on Financial Education from the Russian Federation. Ms. Fagan opened the session by stating the importance of getting together and meeting face to face to connect, share and inspire each other to keep promoting further initiatives for financial inclusion and education. Mr. Gavrilenko shared the initiatives being made by the Russian Federation, and the increased awareness of the importance of such initiatives. As the delegates were able to pose their questions to the others in the room, a question regarding financial literacy to prevent the next financial crisis came up. This started a long discussion regarding the importance to not consider isolated parts as the single solution to a complex problem, such as the financial crisis. Even though many agreed on the importance of financial literacy to prevent irresponsible financial behavior, it became clear that education alone will not be the answer. Instead it need to be a integrated solution that not only make sure that youth grow up being financially literate but also have the values and understanding of their role in their community. During the remaining part of the day delegates were involved in Workshops moderated by McKinsey & Company. The workshops presented the delegates with the opportunity to actively engage in discussion and come up with questions on the topic at hand. The details of the topics and panelists of the workshops are presented below. The day ended with a dinner for all the participants, hosted by Ignazio Angeloni, Director General of the European Central Bank. Mr. Angeloni gave a warm welcoming speech were he spoke about ECB’s ambition to fight unfulfilled opportunities and talents of today’s youth through financial education. The last day of the meeting, on Tuesday November 5th will focus on voicing the opinions and suggestions the 25 youth participants have been working on during Monday, celebrating Global Money Week, as well as have the honor of a closing speech from Mario Draghi, ECB President. Become a Partner ! Join the Child and YouthFinance Movement and gain access to materials and events ! Just a few days ago we celebrated the World Savings Day. But there are still many people who are excluded from the formal financial services and bank accounts. According to a newly made study by MasterCard, the population of unbanked and underbanked totals 93 million people in Western Europe alone. Other studies has shown that only 31.9% of youth in Europe between the ages of 15 – 25 hold an account at formal financial institutions. This means that almost two thirds of Europe’s youth are currently left out of the formal financial institution market. As the financial services offered become increasingly complex, there is an even greater need to make sure that the people who will grow up to make the financial decisions, are educated and experienced enough to do so. Coming up next week, 4-5 November, is the Second CYFI Regional Meeting for Europe & Central Asia. The meeting will take place at the European Central Bank and is a great opportunity to inspire and inform others of the great social and financial winnings attached to making sure that our next generation of adults are financially included and educated. The recent financial crisis has shown us that the decisions made by the adults of today will affect the financial landscape of the future. It is our responsibility to make sure that our children, who will be the adults of tomorrow, are well prepared and educated to make sustainable and favorable decisions for themselves and their countries. But how do we prepare them to make the ‘right’ decisions? The Child and Youth Finance Movement promote two things to make this happen: education and inclusion. We need to make sure that young people have sufficient and proper education on financial matters. But the Child and Youth Finance Movement also believe that we need to make sure that the education is connected to inclusion, to create good habits at an early stage. So what does it really mean, Financial Inclusion? It is about being included, not excluded. Being empowered. Having access. We need to make sure that our children and teens are a part of the financial services and system that will be the venue for some of the most important financial and life decisions they will ever make. We need to make sure that the habit of saving instead of lending, earning interest on savings instead of keeping your money at home, are things that will affect their lives and those of others in many ways. This has been, and continues to be, one of our greatest challenges. Giving all children access to a bank savings account and safe financial services should be part of the fabric of our financial systems. Financial institutions should recognize this is their role in the financial system, their corporate social responsibility, and simply the right thing to do. Facing the issues of financial inclusion in Europe and Central Asia constitutes a challenge in itself. Since the European and Central Asian region consists of such a diverse group of countries, there are specific challenges and opportunities within each country that needs to be approached in the local context. There is no ‘fix all’ solution that can be applied to all the countries of the region. Instead there is a need to move together as one, but keep the solutions and efforts on a local level to meet the local needs. And this is what the Child & Youth Finance Movement is trying to do. Since we launched our Global Movement in 2012, we have already spread to 100 countries and reach 18 million children with financial inclusion and education. This great progress has been made possible through aligning the efforts of countries and organizations to work together toward the same goal: increase the economic citizenship and financial inclusion of children and youth all over the world. The Child Finance Movement builds on the notion that by aligning and supporting the efforts being made by isolated actors we can achieve great change in a short amount of time. One part of aligning these efforts is through our Regional Meetings were we bring together policymakers and leaders of the region with young people to discuss and take action for the future generation of their countries. With the current situation and all time high statistics in the European and Central Asian region, it seems as though this year’s meeting is as relevant as ever. There is a need for nations to join together to build change within their local context, but also cross borders. In order to change the future of our youth we need to start working together. We need to start learning from each other, as well as support and inspire others to make changes that go beyond the actions themselves. Like the rings that spread over the water, we can make great things happen if we only drop a stone big enough. It is our goal to make sure that every child and youngster in Europe and Central Asia are included, a part of, their own financial landscape and are educated to be so. Are your ready to help us pick up the stone and spread the rings? Follow the Meeting via #CYFIEurope, and tune in for the live streamed closing speech by Mr. Mario Draghi, European Central Bank President. The countdown for the CYFI Second Annual Regional Meeting for Europe & Central Asia has started! The countdown has started for the Second Child and Youth Finance International Regional Meeting for Europe and Central Asia! This year we have the privilege to co-host the Meeting with the European Central Bank in Frankfurt am Main, Germany 4 -5 November. The meeting is shaping up to be a game changer for children and young people in Europe. 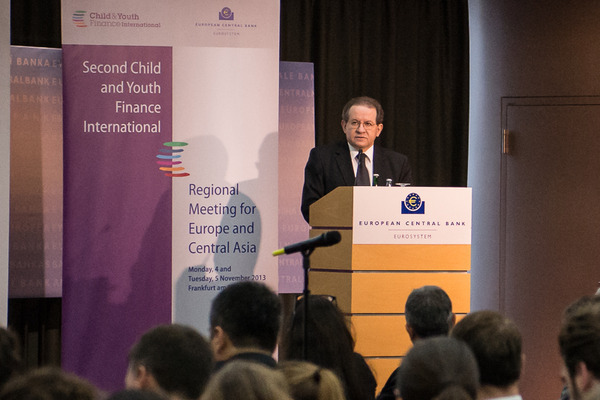 The meeting, featuring closing remarks by European Central Bank President Mario Draghi and inaugurated by Vice President of the European Central Bank, Vítor Constâncio, will bring together leading experts, practitioners and innovators from within the region engaged in issues of increased child and youth financial inclusion, economic citizenship education and youth entrepreneurship. Additionally, 30 youth participants representing the opinions of 1500 youth throughout Europe will present action points on how they want to Reshape their own and Europe’s Financial Future. There will also be several workshops on Financial inclusion policies and regulations, Integration of Economic Citizenship Education in school curriculum, Innovative Financial Education outreach models, as well as Policies Encouraging Youth Entrepreneurship. Have you signed up for the meeting?